How’re those New Year’s resolutions going? Excerpted from The Taco Cleanse © 2015 Wes Allison, Stephanie Bogdanich, Molly R. Frisinger and Jessica Morris. Illustration © 2015 Amey Mathews. All rights reserved. All recipes and photos used with permission of the publisher. Wes Allison, Stephanie Bogdanich, Molly R. Frisinger, and Jessica Morris live in Tacotopia (Austin, TX). 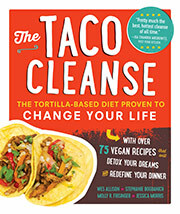 They introduced the Taco Cleanse at the 2013 Vegan Month of Food by eating tacos for breakfast, lunch, and dinner for 30 days. Veganmofo.com said, "It should come as no surprise that the newsworthy, tortilla-stockpiling Taco Cleanse...not only tops my own list of memories, but everyone else's." The Taco Cleanse is their first book together.